Massa and her colleagues on the Let Girls Learn Exchange Program, visiting the Steven F. Udvar-Hazy Air and Space Museum. My name is Massa and I am from Liberia. This is actually a real experience about my life. I never thought I could be outspoken and participatory until I went on the Kennedy-Lugar Youth Exchange and Study (YES) program because I used to be a very shy person. But when I went to the U.S. for the one year program in 2011, I learned how to speak in public, do PowerPoint presentations, and cultural presentations in front of audiences. I also learned how to sing and dance in my American high school. 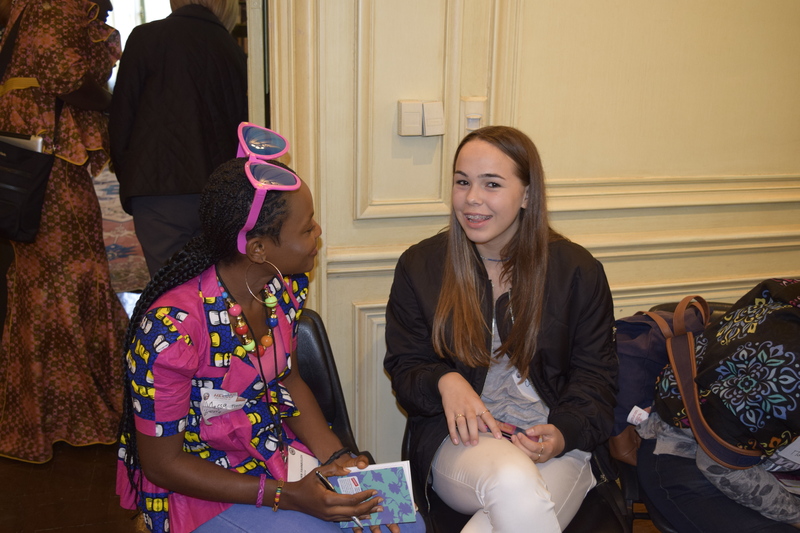 Massa chatting with an American girl during a Peace Corps dialogue event at Meridian. Then came the “Let Girls Learn” program which has also given me more strength and courage to keep going for a better future by meeting Mrs. Obama, the U.S. Ambassador to Liberia, the hard working female Peace Corps volunteers, CNN’s Isha Sesay, actress Frieda Pinto, Tania Jazynka from Meridian International Center, my fellow Let Girls Learn colleagues from Morocco, and the rest of the so many girls and women I interacted with on the program in Washington, DC. I have become more inspired and stronger after the one week Let Girls Learn exchange in DC because I had the courage to apply for a voter registration job for the upcoming election here in my country, Liberia. I also registered for a college entrance test which I will be taking on the 23rd of November. I was inspired and motivated by my Let Girls Learn colleagues from Morocco because I learned that all of those that had finished high school are now in college getting further in their education. I also have been motivated by Madame Sirleaf, the President of Liberia–her term is going to end early next year which I am worried about–and Secretary Hillary Clinton’s courage of contesting against Mr. Trump. Although she didn’t win, I still admire her and I think that she did extremely well and she’s a very strong woman because even after losing the election, she still had the strength to congratulate him and give an amazing concession speech. So, I promise myself that even the sky will never be my limit because I must continue going for my better future until I am successful! 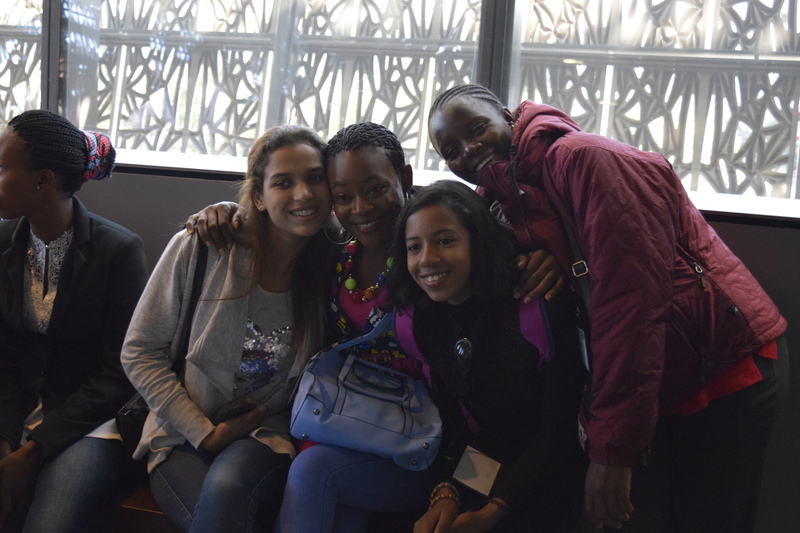 Massa with Moroccan and other Liberian girls at the National Museum of African American History and Culture in Washington. Massolian has done everything possible to get herself where she is today. At the tender age of seven, she had to help her father at his mini-farm in Cape Mount County in Liberia. She carried cassava, oranges, corn, and other produce to the market place to sell in order to raise money for her school fees. Through her courage, hard work, and resilience, she was able to complete her elementary and junior high education. She was selected to participate in the YES program in 2011 in the United States for one year and later returned in 2012 with high school honors. She immediately went back to Singe, where she graduated with a diploma in 2013. She is actively participating in the YES Liberia Alumni Corps, has done a lot of community service work, and conducted workshops with her peers in her home county. She currently serves as the Vice President for the YES Alumni Corps in Liberia and traveled to Washington, DC for the Let Girls Learn Exchange Program in October 2016. POST TAGS: Education, Global Leadership, international education, Meridian Impact, State Department, U.S. Department of State.